I hope you are having a lovely week so far. Supposedly we are going to have Spring return here this week. I am very ready for my feet to thaw out! Did you notice that I posted this on time this week? Want to know why? Nope, it’s not because I finally have my act together. I have misplaced my good drawing paper and cannot continue with the two commissioned drawings until I find it. I am hoping that the distraction of writing will let my brain work on remembering where I put it last. Finally I have a week that involves no crisis management of affairs of an estate, Spring Break is over and I have no huge impending deadlines. Yesterday was great! I worked on my Etsy shop, started these two drawings, did a little practice painting all before I had to pick up Miss L. Today started out pretty much the same way until I realized my drawing paper is missing. Dang! I had two solid hours to work on them. So here I am, coming into the last month and a half of my thirty year career, all geared up to get down to some serious creative doing and making and I am an organizational mess. Normally I know exactly where everything is unless someone I live with moves it and this happens all too frequently. This time I can’t blame them though. In June I will have lived here for two years. In those two years I have had to constantly keep moving my art supplies around. Either a room is being painted/renovated, someone is visiting or moving in, or every spare inch of space is occupied by stuff that has to be sorted, stored or given away eventually. The frustration level with this situation is very high. Really and truly I am a minimalist at heart but I find I am always living primarily with people who are not. My son is the exception. Right now he lives out of a backpack, but take a wild guess who stores his bed and few boxed possessions. My dear husband promises me that one day there will be a separate little art studio that only I have the key to. Looking at our long list of “need to do” items I hope he is planning on adding wheelchair ramp and Geritol dispenser on it. Until then I retreat to my Pinterest board of studio ideas and dream. The current reality is that I set up my fold out table in my bonus daughter’s/guest room for the two weeks that she is away and frantically work on my sewing machine and other projects that have to be spread out (I’m a creative mess so most projects fall in this category) then pack it all back up before she returns. Heaven help me if I forget to take the vacuum cleaner out of her closet before setting up the table. In that case, or any other that requires something from that closet, I have to crawl over the bed to the other side, retrieve the item then push or pull it back across the bed. There are many not so nice words said during this ordeal. If the table issue were not enough the fact that I have my most used supplies in…the china cabinet, under our bed, under the love seat, under and on my desk, in a file cabinet in Miss L’s room, beside the sofa, in an end table, on our bookshelf, AND in the master bathroom! The less needed supplies are in our storage unit 20 minutes away and I seem to need them several times a month. Honestly I do not own a store’s worth of supplies. We just have so little space that I have to stick them in every nook and cranny I can find. Trying to find what I need causes some high level frustration. HOPEFULLY as I wind down my design business and clean out files and supplies that I will no longer need, I can begin to consolidate the art supplies and cut down on the frustration. Did I mention that the nearest art supply store is over an hour away by car or two days away via Amazon. Wonder if I can figure out how to make horse hair paint brushes? Maybe I should remember to give myself a pat on the back any time I manage to finish ANYTHING. Here are a couple of finished items from this week. 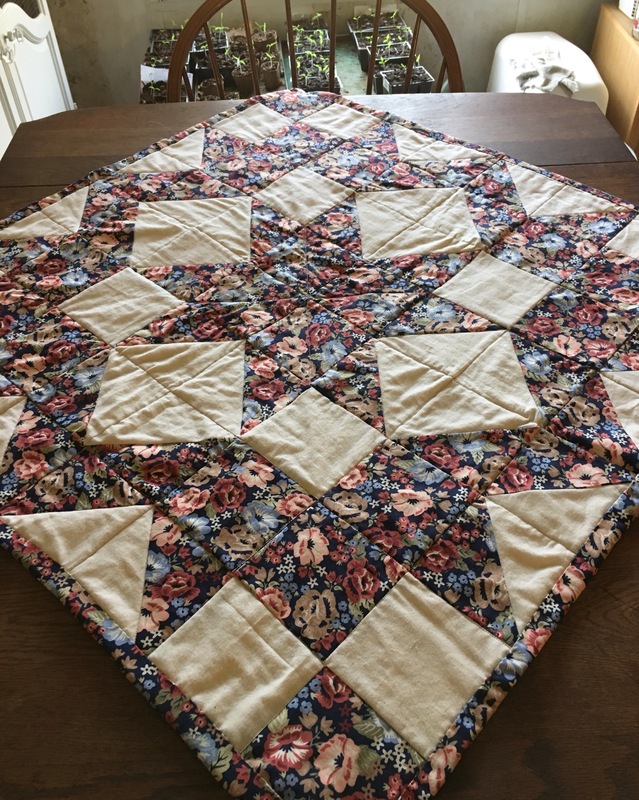 My table quilt from my class got finished. Probably the worst sewing I have done in years but it doesn’t look too bad as long as you don’t look on the back, and a small painting of our cat, Sweetie Pie. 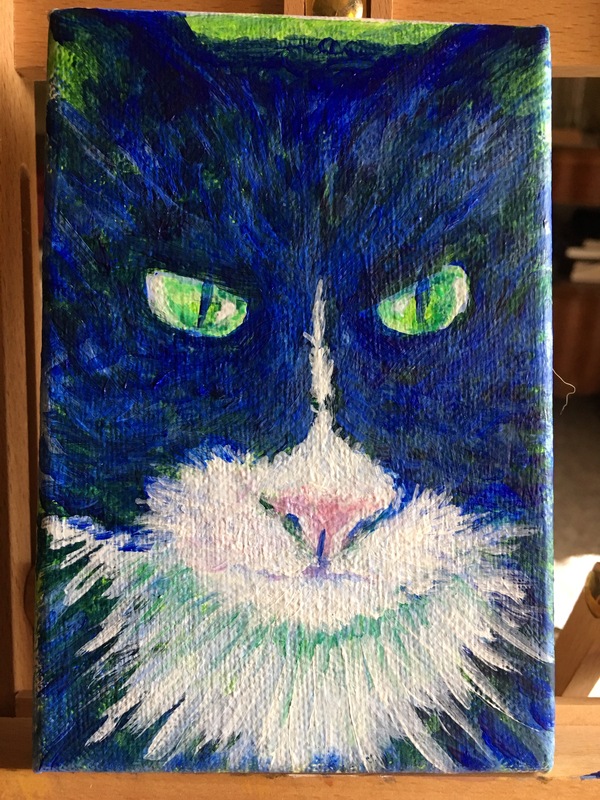 I have her eyes too close together but I was focusing on some painting techniques more that worrying about getting everything “right”. I am going to make myself some lunch, take some water to the chickens, gather some eggs and make sure I didn’t put my drawing paper in their coop. May your week have low levels of frustration!